Ross Video (stand 11.C10) has announced the launch of BACH Liberty and XPression V.85 at IBC 2018. 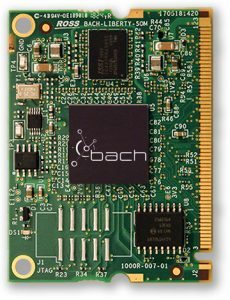 BACH Liberty is a drop-in replacement, pin-compatible module to Dante Brooklyn II, featuring a fully compliant AES67 and ST-2110 implementation that is guaranteed interoperable. With BACH Liberty, customers are able plug into full standards compliance. The XPression team at Ross Video have announce that XPression Version 8.5 — the most advanced real-time motion graphics engine software Ross Video has ever released, will be shown at this year’s IBC show in Amsterdam. An evolution in XPression, Version 8.5 continues to deliver an intuitive and cost-effective product which is used in workflows from simple character generator tasks all the way up to complex virtual environments to a whole new set of customers. New features of XPression version 8.5 include a global search engine within the active XPression project, NLE plug-in support for Adobe Premiere Pro for Windows, an HTML5 version of the XPression MOS plug-in, enhancements to XPression’s revolutionary DataLinq tools; including new additional data source types, ADODB Source file browsing, DataLinq source sorting, and new filtering tools for Dashboard DataLinq sources. Ross Video will also be demoing XPression render engines in a 64-bit edition, which extends XPression’s unrivaled cache management, allowing for even larger XPression projects. As part of the 64-bit edition of XPression, users will also find support for importing Cinema4D models and scenes. Ross Video will be demonstrating the BACH Liberty Module and XPression V.85 throughout IBC 2018.